They have added a new topic to the list of topics they cover, Cryptozoology. Bigfoot is Real is a 2 Disc DVD set. 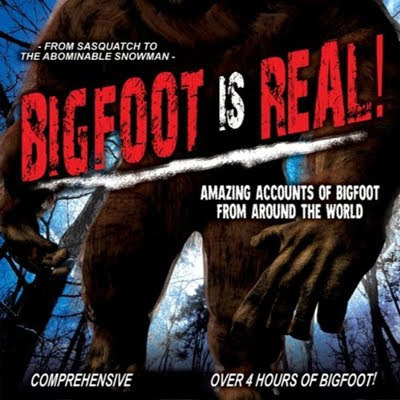 The first disc contains three documentaries; Bigfooting in Oklahoma, Tale of the Honey Island Swamp Monster, and Swamp Apes. The second disc contains The Wildman of Kentucky. Disc one contains three documentaries, the first documentary is titled ‘Bigfooting in Oklahoma’ and it centers around a woman named Esther Schritter who at a very young age first encountered what she believed to be Bigfoot. After the initial set up in which she retells of her numerous encounters with Bigfoot. The remaining time is spent with her searching for Bigfoot and talking to other people who have also seen Bigfoot. Content wise this is a one sided affair as everyone involved are hell bent that Bigfoot exists and no counter argument is ever entered into the discussion. The second documentary is titled ‘Tale of the Honey Island Swamp Monster’ and it revolves around to documentarians who went to shot some background footage ‘the Honey Island Swamp Monster’ and how they uncovered a hoax. This is easily the most entertaining documentary included with this set. The third documentary titled ‘Swamp Apes’, once again follows the urban monster mythos prototype. This time around the focus is the different cultures over the centuries who have visited America and the animals like primates that may have brought over by them. This is a dry and times overly clinical documentary that never offers up any real answers. The main center piece of this release is a lengthy documentary titled ‘The Wildman of Kentucky’ and it is located on disc two. 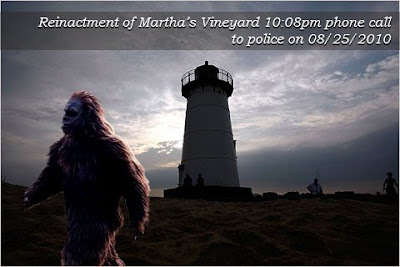 Even though there is plenty of information offered up about Bigfoot and other urban legends. Most of the information has been covered elsewhere countless times before. Also while there are many questions posed. Too much is left up to the viewers own interruption and no real answers are ever put forth. Scooter's report brings up a few journalistic red flags. 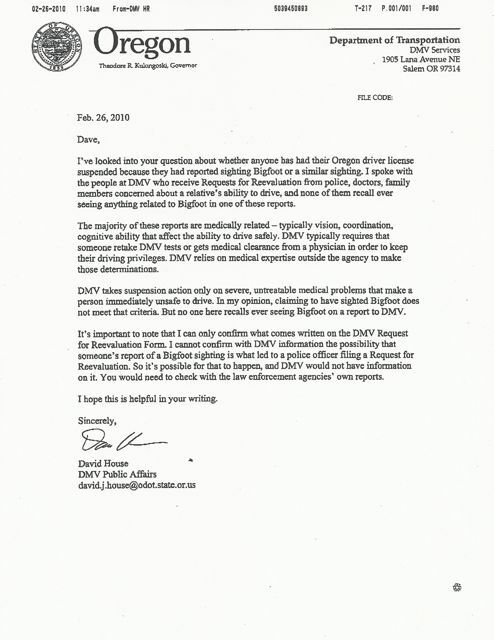 None-the-less we did try to contact Police Chief Erik G. Blake and Executive Assistant Suzanne Cioffi of the Oak Bluffs police department, to confirm this report. While we have heard nothing yet we will have an update if they return our calls and emails. To get an idea of the geography of this siting we have provided a map below. 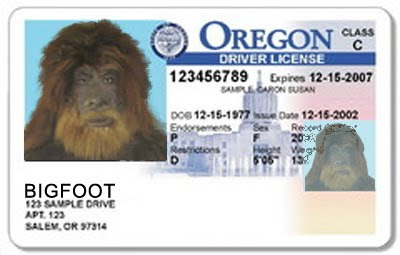 Every Year in late August Skamania county celebrates their 1984 ordinance, declaring Bigfoot a protected species. Although most places on the web have a small snippet of the ordinance we have the whole thing here. Today, August 27th, 2010, they are celebrating it again, although they have not promoted it very heavily this year. Even the website seems to be below par to previous two years. This is the third annual Bigfoot Bash and Bounty, they are 45 minutes away from downtown Portland. If you get a chance go check them out! They have tons of activities planned and vendors with plenty of good stuff. this is a great opportunity for you to read the county ordinance at our earlier post here. 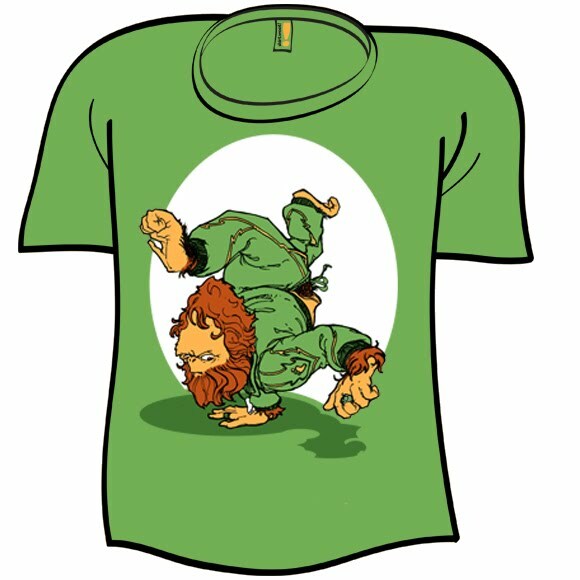 hey everybody, our artist, Guy Edwards, saw our woot tshirt post and decided to submit a design of his own. 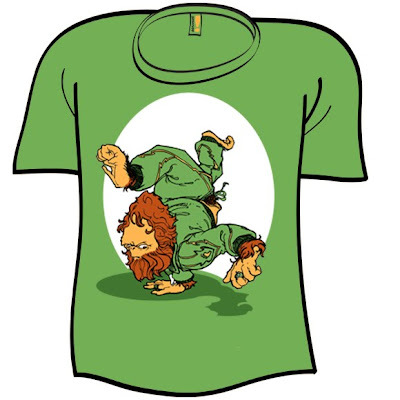 If you like go to http://shirt.woot.com/Derby/Entry.aspx?id=45151 create a woot account (if you dont have one) and vote for his design. Monty Python is often credited as blending the absurdly random with the brilliant, all at once. Imagine if they had also loved Bigfoot. Enter Craig Flipy. 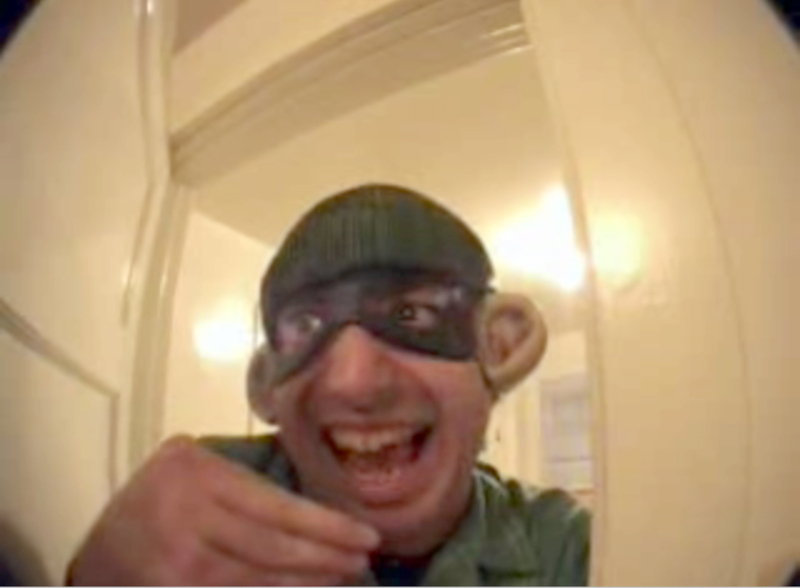 Oh you may remember him from the best bigfoot short film on You Tube, The Legend of Beerfoot. To this day it is one of our most popular posts. Craig has been busy since those days. At crappylittledreams.com Craig has neatly tied together his YouTube channel, a story about looking for bigfoot on a moped, and a new blog; effectively creating a portal to his media empire--if not his mind. NO! We dont mean outer space (not in this post anyway). We are referring to the new scientific term, Living Space - more formally known as the "ecological niche concept" by biologists - refers to the particular requirements of an organism to thrive. It includes factors like the availability of food and a favorable habitat. In a new report that seems to challenge the driving engine for evolution. PhD student Sarda Sahney claims it was the available Living Space (or lack of competition) that created and drove biodiversity and not necessarily competition itself, as Darwin suggested. One of his examples is the evolution of birds, when dinosaurs learned to fly, the sky was literally the limit and without any predators in the sky, there was no competition, and birds thrived. 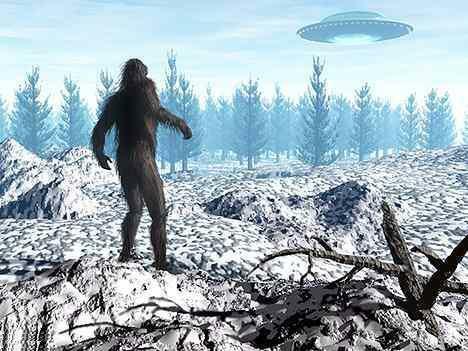 How does Bigfoot fall into all of this? Well, in an earlier post about Ecological Niche (Living Space) Modeling of Bigfoot, we shared a scientific paper illustrating the parallels of Bigfoot and the Black Bear sharing the same habitat, diet, migration etc. 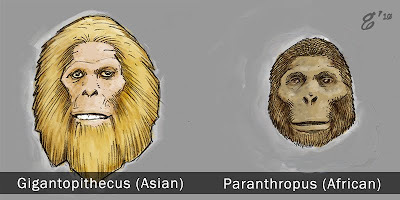 Our best candidates for Bigfoot in the fossil record are either Gigantopithecus blacki or Paranthropus aethiopicus. Either of these species existed a million years before Black Bears or any other likely competitors in North america. If either of these two species are the early ancestors of Bigfoot, then this new study about living spaces could support how and why a Sasquatch would thrive in North America. It simply had a million years to do so. 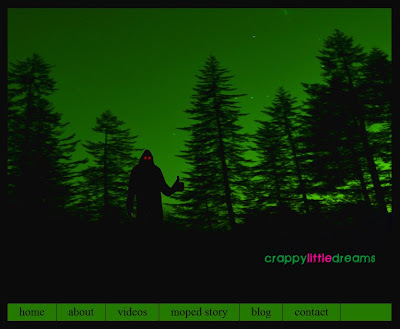 Hello and welcome to the 2010 Boggy Depot Bigfoot Conference Homepage! 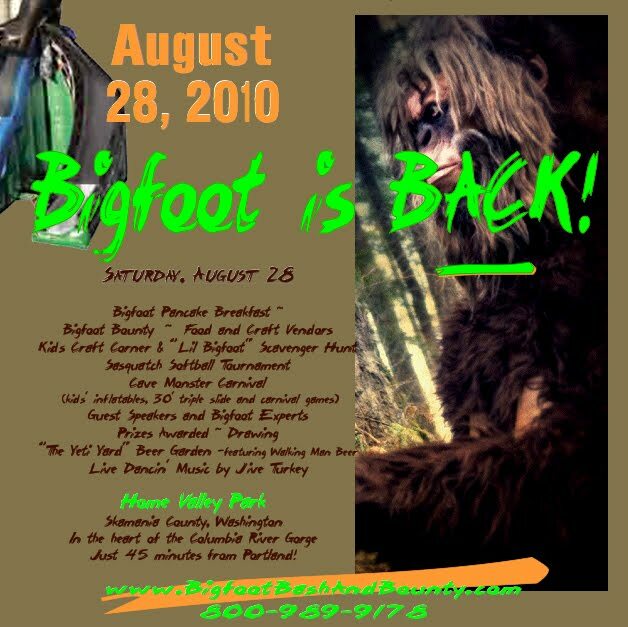 The Boggy Depot Bigfoot Conference is different than some of the other conferences you may have attended in the past. First and foremost the goal of the conference is to raise money for the Chilldren's Hospital Foundation and the Children's Miracle Network! The Children's Miracle Network has been around since 1983 and creates miracles by funding medical care, research and education that saves and improves the lives of 17 million children each year. By helping the Boggy Depot Bigfoot Conference you can help create miracles for children everywhere. We know the whole family will have a great time because we have something for everyone! See you soon! There are at least 3 reasons we think this is going to be a great show. 1. Its a fundraiser for a two great causes; the Chilldren's Hospital Foundation and the Children's Miracle Network! 2. Its sponsored by two of our favorite corporations leveraging Bigfoot as an icon; The Carolina Pad Company and Jack Link's Beef Jerky. 3. Two Words; Scott Nelson. We are HUGE fans of Scott Nelson. Scott Nelson is a Retired Navy Crypto-linguist with over 30 years of training and experiance in Foreign Language and Linguistics. This includes among other duties the collection, transcription, analysis and reporting of voice communications. 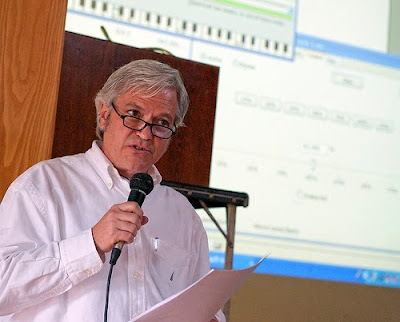 Scott Has taken it to task to study the Berry/Morehead tapes recorded in the Sierras of what is purported to be an unkown language and share his findings to the Scientific Community. We have posted the actual phonetic alphabet developed/discovered by Scott Nelson here. We saw him at the Oregon Sasquatch Symposium and he was definitely one of the most engaging speakers. 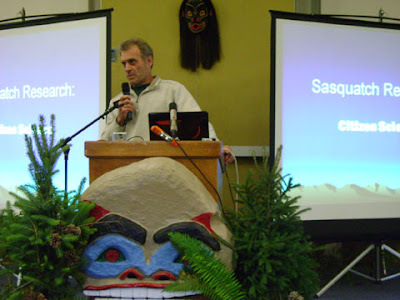 If you have heard him at any of his radio interviews, he realy shines when he has his own platform to methodically build the nearrative of how he discovered Bigfoot Language. 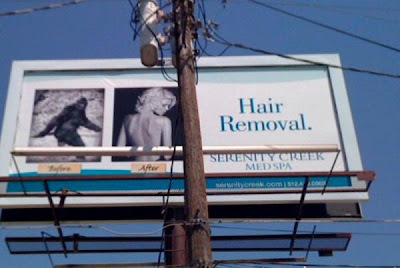 Tired of leaving the red carpet and having to change before you do your Bigfoot field research? 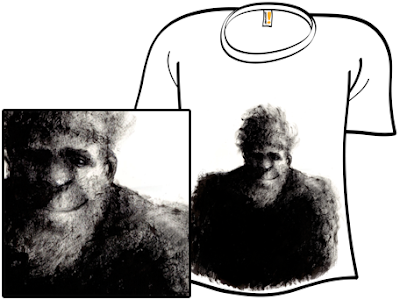 Or want to look good while your trying to get a good look at a Sasquatch? Some fashion designers have taken both of those into consideration. Below is an excerpt from our pals at Hypebeast describing nonnative, the guys behind this awesome clothing collections tailored for Bigfooters. Japanese contemporary brand nonnative presents its new collection for Fall/Winter 2010. Entitled “Yeti Hunting Club”, the lineup focuses on exactly that, garments inspired by the outdoors. As extensive as any of the brand’s recent collections, Fall/Winter draws a solid color palette, with greens and oranges blended amongst more subtle, dark hues. 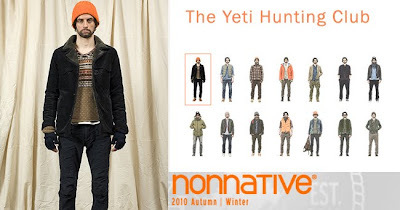 Arguably one of their better collections to date, “Yeti Hunting Club” boasts just about everything one would need in its wardrobe, including outerwear, denim, knits, headwear, footwear, and just about everything else in between. 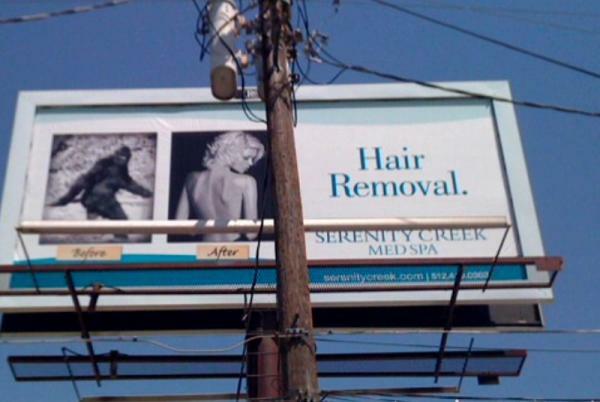 ANAMOLY Magazine reports there are at least 3 of these Billboards in Austin, Texas. ANOMALY magazine is a new online and print publication based in Austin, Texas and founded in late 2007 by SMiles Lewis, Jeremy Wells, Mack White and Thom White. ANOMALY magazine is an evolving news source for Austinites, Texans, Americans and Earthlings in general. ANOMALY magazine is seeking Advertising Sponsors & Content Contributers. The illustration above is based on the particular Bigfoot That inhabits Georgia. Below is some actual footage of a savanna swamp ape. Jim Miles is the author of two Weird Georgia books. Weird Georgia is part alternative state history and part renegade tour guide. Read about Georgia weirdness and decide for yourself if the stories of UFOs, Bigfoot, ghosts, natural phenomenon, citizens with unusual abilities and archeological curiosities should be taken seriously. Use the INTERACTIVE MAP to plan family outings. In 2000 a family purchased 30 acres of land in rural Elbert County and took up residence. Since then they and neighbors have had many sightings of a Bigfoot creature. They have found anomalous footprints, smelled the creature, and heard grunts, screams, and whoops, the latter a “low to high bass sound lasting several seconds,” wrote Bigfoot Field Researchers Organization (BFRO) investigator Morris Collins. Also reported were “feelings of being watched, feelings that the family should leave a particular area, and at least one stalking incident involving the witness being separated from her mother, father and the family dog becoming very frightened.” The dog has acted intimidated both inside and outside the house. In one instance a teenager and an adult riding a 4-wheeler on the property sighted the creature. Encounters often occur when only women are present, a peculiarity noted in other cases. 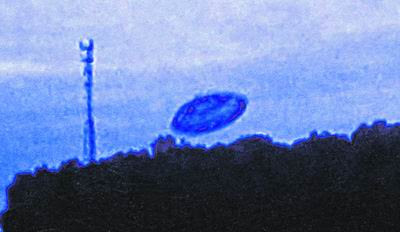 Sightings have happened in all seasons and at every time of day for a decade. The Humboldt beacon updates thier continuing coverage of the Falcon project. The project is headed by William Barnes of Nevada City as a joint endeavor which includes William Dranginis of Virginia Bigfoot Research and Jason Valenti of Sasquatch Research. Together, the team has produced a 19-page Business Plan that details the Falcon Project in full. The Falcon Project website is at www.bigfoot24-7.com. 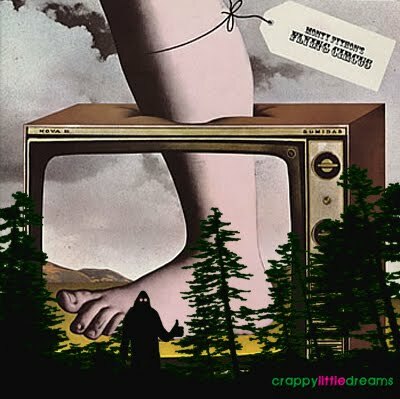 We have our own editorial, on the Falcon Project (read: A Blimp to Find Bigfoot) dicussing it's website ties to Lloyd Pye's version of Bigfoot, hominoids (read: Theres always room for Pye). 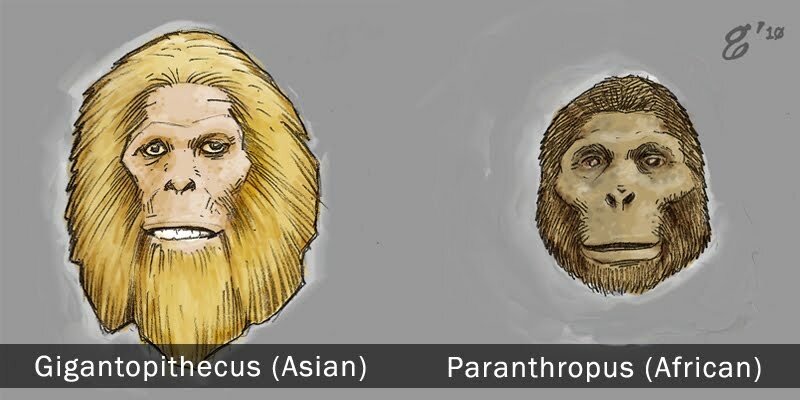 Pye claims that these animals (Bigfoot, Yeti, Etc..) are Earth's only indigenous bipedal primates, and that early hominids such as Neanderthals and Australopithecines are not intermediates in human evolution. Barnes explained that his team would base their first search efforts on locations known to have been visited by the creature. 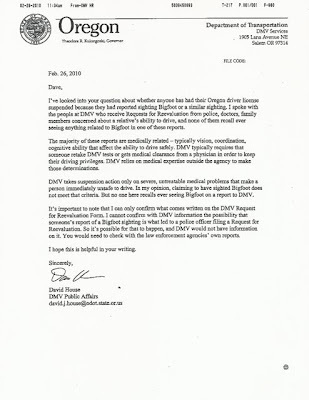 “We would go to an area around Klammath River, and I would be using historical sighting maps and documentation that has been deemed credible. I would not stop in one place for long durations, since there have been many sightings on the entire West Coast,” Barnes clarified. And yes, Barnes plans on using a unique, one-of-a-kind 35-foot blimp that will hover over areas of special interest. “Mine is being custom-made for the job it has to do. It is a remote control and is being made to go up to five hours glide time,” Barnes said. Meanwhile, his RV will act as a control center during the flyover and film investigation. Barnes acknowleges that films can be simple to fake, especially small ones. His plot therefore, is to film a documentary following the building of the blimp, installation of infrared cameras, and volunteers at work. ”The thermal-imaging cameras are the newest in today's technology, and are the same as the ones being used by the military. The infrared camera can describe an image in the dark, as clearly as though it were in daylight,” Barnes added. 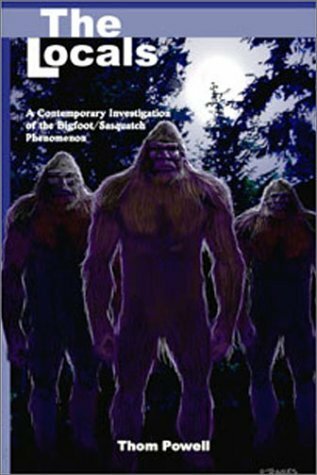 To help Barnes in the endeavor, the Big Foot stalker will use a five-person crew who will be alert to the creature's presence around the clock. Not worried of skeptics or naysayers, Barnes clarified that the reason why his project was concieved is to prove that the creature is real, and is not something fabricated to sell books and movies. “Because it is controversial, human curiousity drives us to investigate further,” he said. Keeping tabs on the pulse Bigfoot, Sasquatch and Yeti news is a full time job. Good thing someone invented unpaid interns (AKA Nephews). Our interns compete to bring you the next story worthy of Bigfoot Lunch Club Fans. And by compete, we put three of them in a 12x12 room with only a single poolstick strategically placed in the middle. 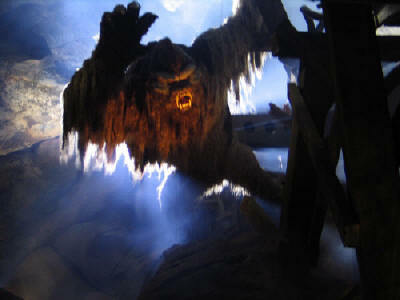 Finally our oldest neph--er, I mean intern, Tenzing, prevailed and he's been begging for us to report on the Broken Yeti at the Expedition Everest attraction at Disney’s Animal Kingdom. This has become a grass-roots political-like movement among ride enthusiasts. With two facebook campaigns and several news articles, we thought we should give them our Bigfoot Lunch Club bump. Shouldn'nt bigfooters be behind this campaign?! Let's see what our 700-strong fans on facebook can do to these campaigns. As you may well know, we are an inclusive bunch. 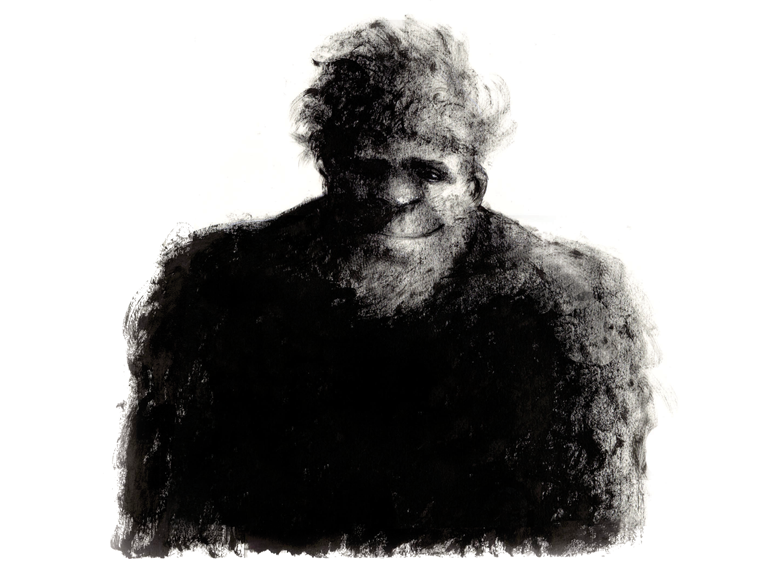 We are adamant in believing the pool of bigfoot theories should be as diverse as possible--at least until we find her. One of our goals is to foster and elevate as many different ideas and theories as possible. Call us Pollyanna, we believe everybody in the community is mature enough to share ideas that are, on the surface, contradictory. 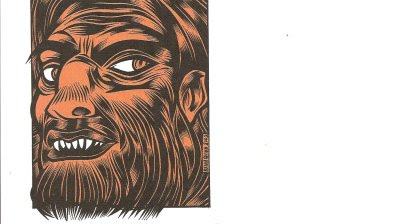 I had a chance to interview the owner of the website, Scott Walker of Ohio, his story speaks not only to Bigfoot from a creationist Christian point-of-view, but also speaks to over policing at Bigfoot Forums can exclude fellow Bigfooters. BLC: Hi Scott, we find it fascinating you are using Bigfoot to spread an evangelical message, on the surface we felt it was a bait-and-switch, but upon further reading we realized this was a real Bigfooter. 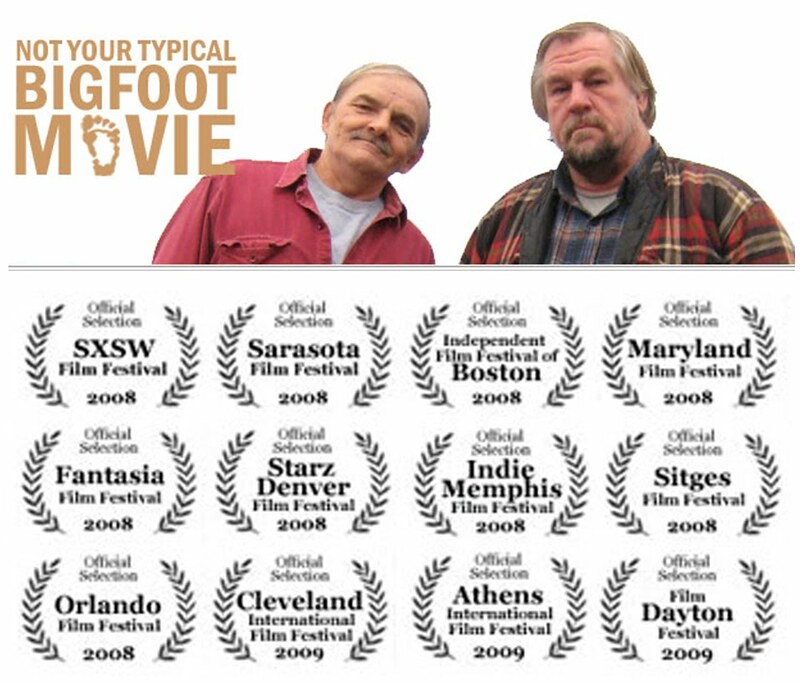 Where does your interest in Bigfoot come from? SCOTT: I have been interested in BF (Bigfoot) investigating for the past 8 years. I had what I believe was an encounter with "something" in the woods that scared me to death. I never saw anything but I could tell that something was wrong and I was in danger. I later found out that a sheriff deputy had an encounter with a BF in the exact same area just a few months prior to my event. 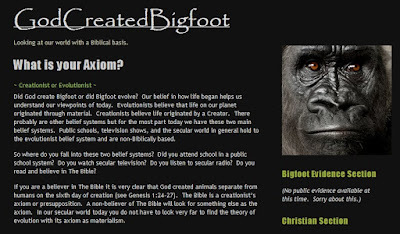 BLC: We had assumed (incorrectly) that all Bigfooters are evolutionist. Its a perspective that is rarely heard in the community. Is this why you created your website? SCOTT: My website was created to offer Christian believers a place to find information about how God's creation does indeed include the elusive Bigfoot creature. BF has nothing to do with evolution; however, you will find on many BF forums the idea that this is somehow the evolved man missing link. 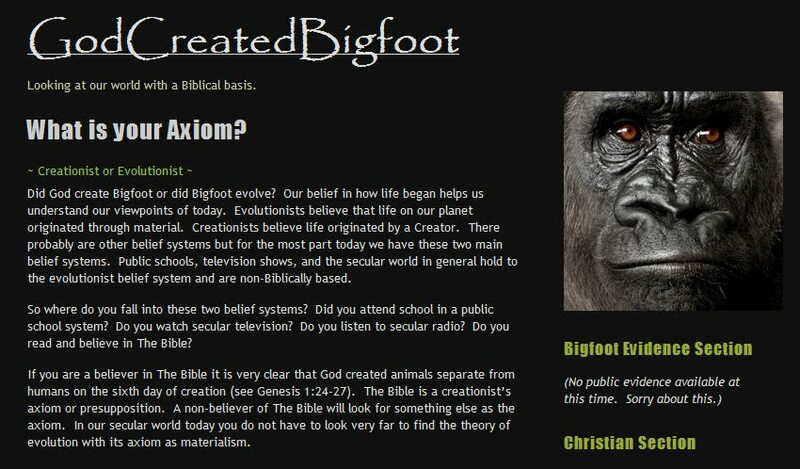 I wanted to try to connect with other Christians and form a Bible believing Bigfoot research group. BLC:What are the plans for the future of the website? SCOTT: Maybe some day I will have an actual visual encounter with a BF. At this point I have to be honest and say that I have nothing to show for the years of research I have invested. The best I have done is witnessed very strange screams in the forest. Screams that do not make any sense at all except for the possibility it was a BF. BLC:Thank you for you time Scott, please keep us posted on any new efforts, although we differ, we feel it is important all voices are heard in the community and a good theory towards discovery can come from anywhere. SCOTT:Thank you for your interest and if you have any further questions just let me know.